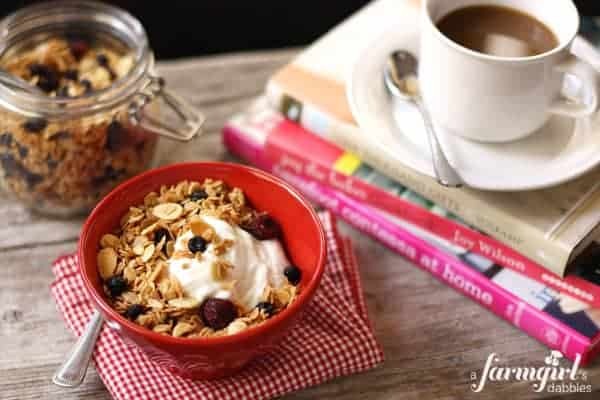 Homemade granola is so much better than pre-packaged. Bake up a batch of Merry Almond Cherry Berry Granola for your own breakfast bowls and to package as gifts! 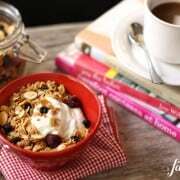 This past year has proven to be my awakening to the goodness of homemade granola. Before being convinced to make my first batch, I would roll my eyes whenever anyone spoke of making their own granola. What a complete waste of time and energy, I thought. 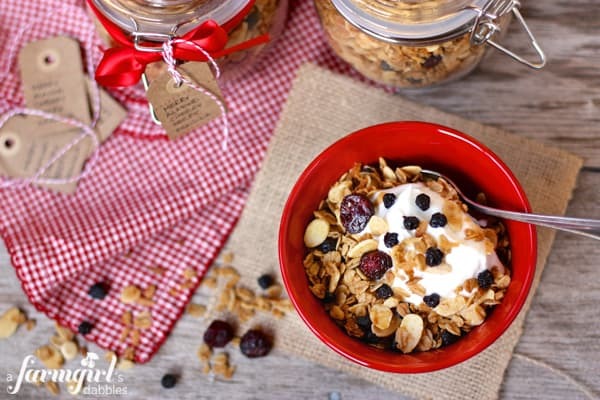 Homemade granola blows that pre-packaged stuff away! I’ve eaten more granola this past year than I’ve eaten in my entire life. There is always, and I mean ALWAYS, a container of fresh homemade granola in our cupboard now. As soon as it’s gone, another pan goes in the oven to bake. Each batch is always a little or alot different, as granola is so easy to change up according to what you are craving, or what you have on hand at the moment. But right now, my family is loving this Merry Almond Cherry Berry Granola. I just know you’ll like it, too! 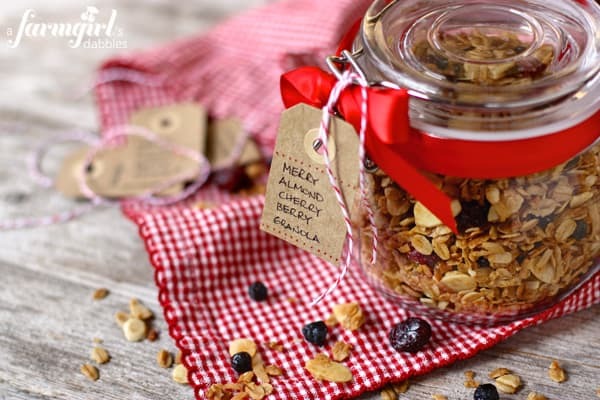 When scooped into a fun jar and tied with pretty ribbon, this already festive almond cherry berry granola turns into a special gift, created from your own heart and precious time. I bet it won’t take you long to come up with names of a few people who would like to discover a jar of this under the Christmas tree. Gather the ingredients, turn on the oven, and bake some granola! Preheat oven to 300°F. Spray two large rimmed baking sheets lightly with cooking spray and set aside. In a large bowl, combine oats, coconut, almonds, brown sugar, cinnamon, salt, and nutmeg. In a medium bowl, whisk together coconut oil, maple syrup, almond extract, and vanilla extract. Pour liquid mixture over dry mixture and fold until evenly coated. Divide mixture between the two prepared pans and spread out evenly. Bake for about 40 minutes, or until granola is nicely browned. Stir every 10 minutes, rotating pans on oven racks each time. Let cool completely, then stir in blueberries and cherries. Store in airtight container. Note: This recipe makes a large batch and can easily be cut in half.